"A black so deep, so noble that once seen, it stays in the memory forever." Coco Chanel once said, "Dress women in black or white at a ball. They will catch the eye." And she did just that. Chanel designed a little something special in 1926 that would last for generations to come . . . a little black dress. Yes, there were other black dresses at the time, but not fashionable ones worn outside of a funeral or the servants' quarters of a stately home. In the 1920s, Chanel spent an evening at the opera and was sickened by all the flashy colors worn. She then decided to dress all those high society women in black. In November 1926, Vogue dubbed Coco's new little wonder the "Ford dress" in honor of Henry Ford's monchromatic Model T. Like the pioneering American vehicle, It was simple and it was fabulous. Chanel said, "Before me, no one would have dared to dress in black." After the famous dress was unveiled, it soon became known as "the modern woman's uniform" and everyone was eager to replicate Chanel's style. Karl Lagerfeld replicated the dress close to its original form for Chanel's 1999 fall collection. Its modern and chic design made it as relevant then as it was in the twenties. After purchasing matching black and white Italian textured fabrics, I worked on getting the bottom of my dress just right. My aim was to perfectly drape it in front while angling it down in the back so that the contrasting white would show through. Although I had never designed a dress silhouette like it before, it really worked out well and I was happy with the end result. 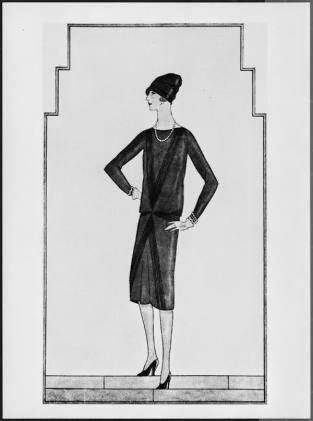 It is simple, yet timeless as Coco Chanel's original little black dress was. Just as Coco said, "A well-tailored dress suits everyone."